"Forget Shenandoah. This is more like folk Mozart meets Bobby McFerrin. These young singers redefine our concept of 'youth choir'." 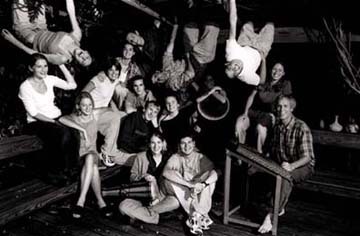 In September 1997 the Ooolites came together as a studio ensemble to record two CDs of Dalglish folk choir music, Hymnody of Earth, and Pleasure. The Ooolites were born. 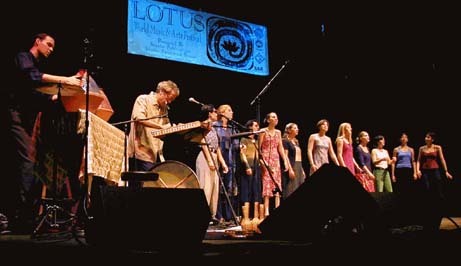 From those beginnings, the Ooolites have gone on to become one of the most dynamic performing ensembles in the explosive music scene of Bloomington Indiana, with featured appearances at The Lotus World Music Festival and The Bloomington Early Music Festival . The membership includes nationally renowned singers and dancers as well as those who are still in school. 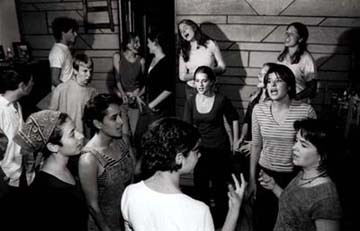 They've all grown up in folk music and dance worlds with diverse areas of expertise ranging from percussive forms of dance like clogging and tap, old time American fiddle and dance music to early American and European sacred music, African and Balkan music and dance, and original contemporary a cappella music. Their performances, the product of fun and chaotic rehearsals, are held together by group movement, animated theatrics and sheer enthusiasm for the music.